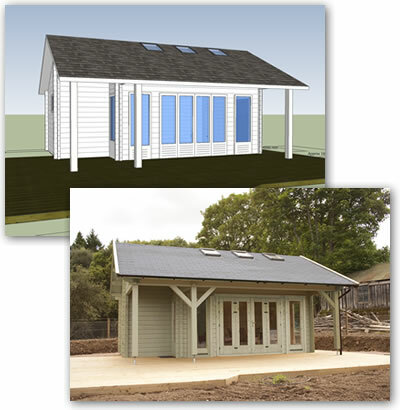 At Forest Products, we would consider custom designed, bespoke buildings to be our speciality. 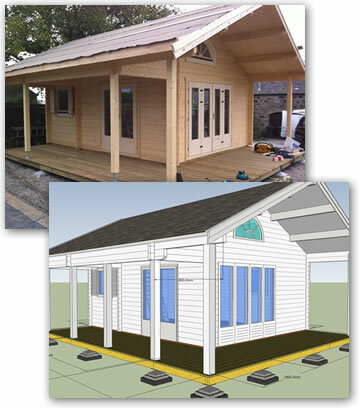 We have been designing and producing custom buildings for most of our 20+ years in business, and have constantly been surprised by the uses to which our buildings are put. Although we are obviously very happy to sell you a building straight from the catalogue, more often than not, it is not quite what you are looking for. You could start by basing your building on one of the catalogue models, but maybe you prefer different windows, sometimes the size isn't quite right, maybe an internal wall is required, whatever the change, we can accommodate it. Alternatively you can completely ignore all the catalogues and start from scratch. If you come to us with even just your overall maximum sizes, we will help you focus your ideas into the building of your dreams. We can advise on window and door placement, wall thickness, insulation options, roof coverings and even the best paints to finish off your building. We will then draw the building in 3D for you to see, price it all and send you pictures so you can mull it over and then tweak the drawings with any final little alterations that are necessary. Whether it is a large double garage with a workshop room, a summerhouse with covered areas for hot tubs & barbecues, a multi-room log cabin for guest accommodation or even just a basic tool shed, you are in total control - almost anything is possible. To get a quote for your new building or to arrange a meeting with us please either complete this form or give us a call on 01330 860505. Alternatively just come in to our display site, we are open 6 days a week, Mon-Sat from 10am until 5pm and would be happy to see you.